The case in the article use Visual Studio 2008 and .NET Framework 3.5, i e the latest version of the .NET platform. It shows how to implement the latest new technologies (WPF, WCF and LINQ) in VSTO solutions for Office. It also shows the complexity involved to create such solutions as mentioned in the article. I find the article to be well written and I hope Andrew will be able to write more articles. However, I cannot disregard from the gap between what VS 2008 offer and what Excel as a development platform offer. For me it’s quite obvious that MSFT must upgrade Excel’s development environment in the next coming version. After all, Excel as a development platform is still a too important platform to be neglected. 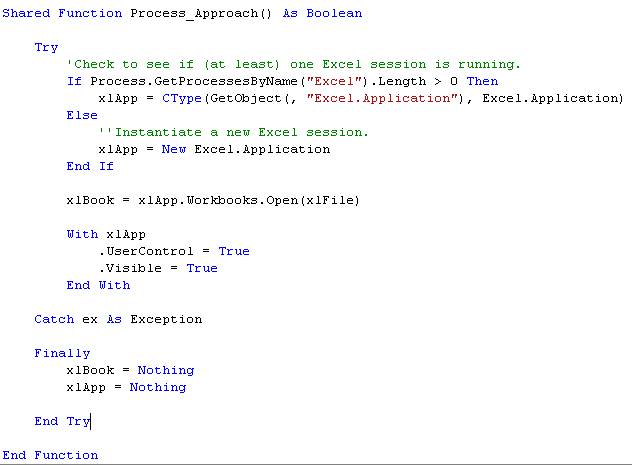 When automating Excel from VB we can either create new instances or access already running instances. In different scenarios different methods may be needed in order to get workable solutions. This is a rather simple method but it does the work and we can handle the situation if any error is raised. In the third scenario another approach is used which is based on BindToMoniker. 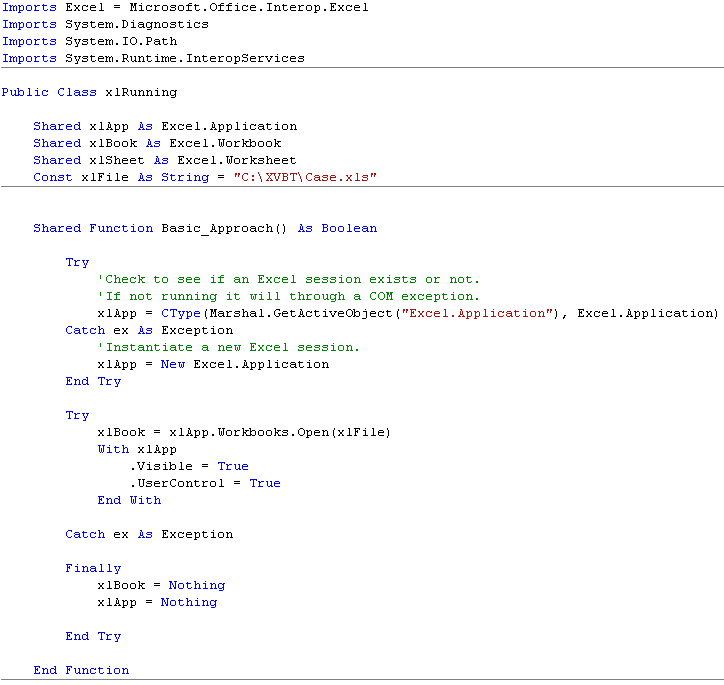 Unlike the above methods it works ‘botttom up’ (in the Excel’s object model) as it gets an interface pointer identified by the specified moniker, here the workbook file. 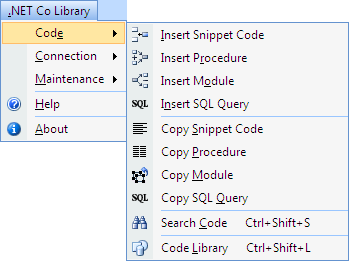 The method provides the same functionality as the GetObject method in VB 6. I have not tested how it works when using the Dual Core Processor and instantiate new Windows processes. 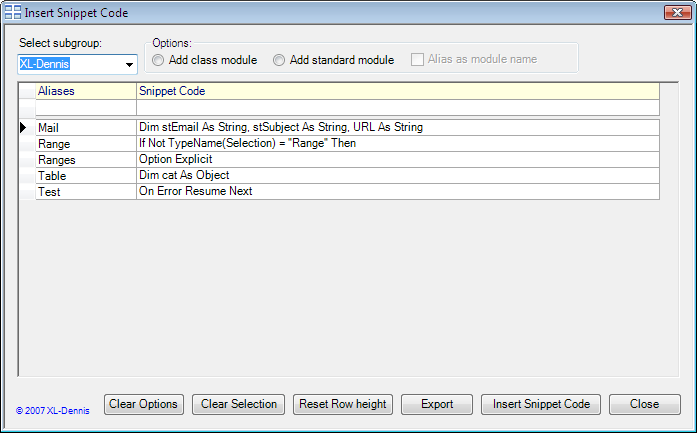 I have made the class module available as a textfile which can viewed or saved from here. 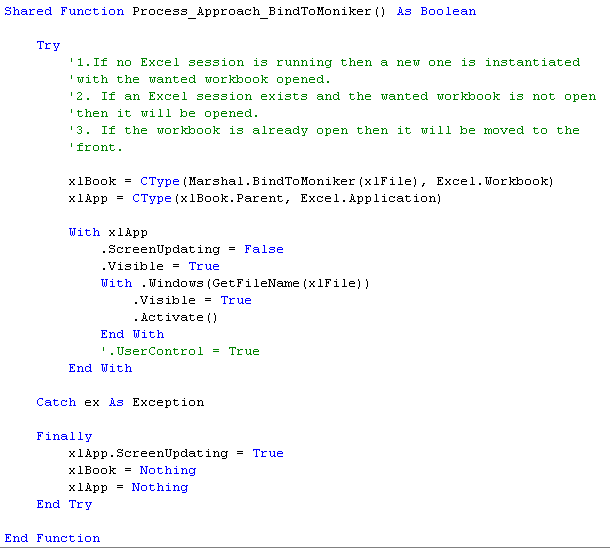 In some forums I frequent (more precisely lurking around) the question “How can we open Excel workbooks in .NET solutions?” is raised from time to time. Usually it does not refer to how to read data from closed Excel workbooks rather how to open and work with workbooks in VB.NET and in a similar manner as we can do in Excel. Which approach to use is due to how much access the users should have to Excel’s built-in features and how much to work with the data. In some cases as little as possible while in other scenarios as much as possible. To say which approach is the best to use is subject to the actual situation and what the components actually can do. Using the the .NET WebBrowser Control is similar but not identical to open Excel workbooks through Internet Explorer. 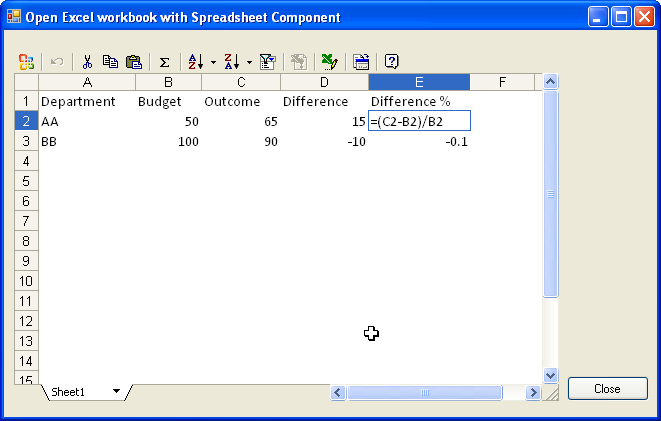 It requires that Excel is available in order to open the workbooks. The major drawback with this component is that we don’t have access to the Worksheet menu bar and that we need to write code to access functions in the other commandbars. The right click menu in the worksheet space is available when using this control. MSFT has made available an ActiveX control for hosting Office documents. Unfortunately it’s no longer available at their support site. 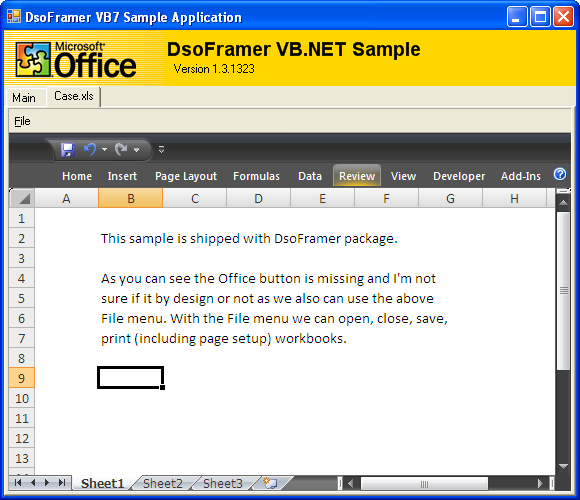 But you can download it from Microsoft Developer Support Office Framer Control Sample (KB 311765) 1.3. 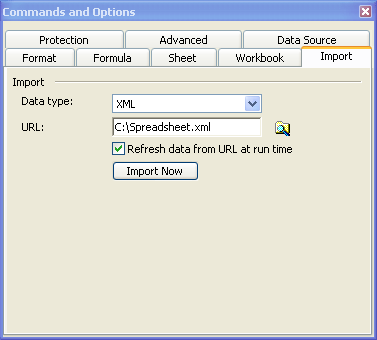 This control also requires that Excel is available in order to open workbooks. 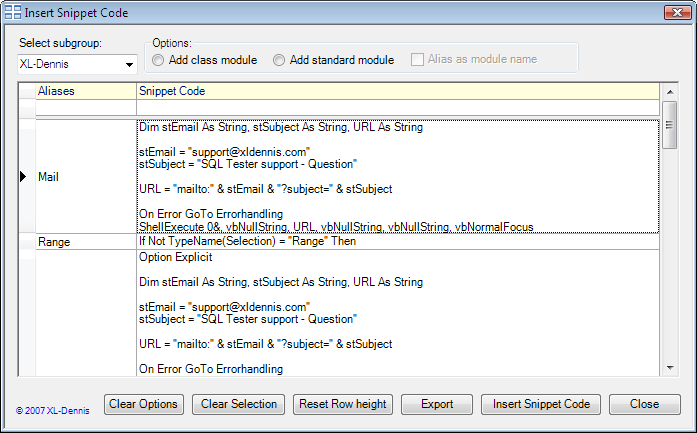 The package that is available for download includes samples for classic VB, VB.NET and the Web. Since the source files are included we can change the code and compile our own version(s) of it. 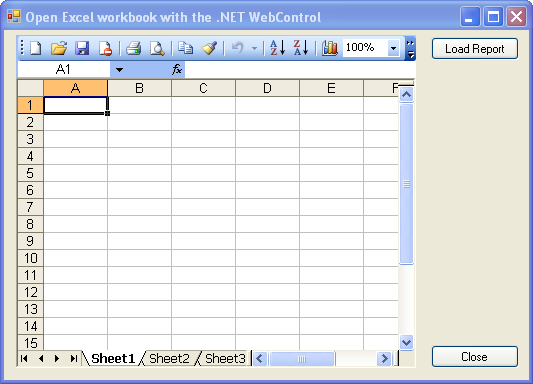 Compared with .NET WebControl the Worksheet menu bar is available and it can also handle several open Excel workbooks. The right click menu in the worksheet space is also available with this control. To enable Registration-Free COM for the Office Framer Control within the Visual Studio .NET 2005 project, simply right-click the unmanaged project reference, select Properties, and then on the properties panel for the reference, set “Isolated” to “True”. This will tell Visual Studio to generate a COM registration manifest for the application with the information necessary to activate and launch the unmanaged control. This component does not requires that Excel is available. On the other hand we cannot require that it will be a full substitute for Excel. It offer some basic functions and therefore the component is a good candidate to only show data from Excel workbooks or when the users may need to change a limited amount of data. One native good tool is the AutoFilter. This is the ultimated .NET spreadsheet component. FarPoint Spread does not require having Excel available but can open and work with native Excel workbooks. In my opinion its simple the best component for spreadsheeting outside Excel and other dedicated spreadsheet tools (which is also reflected in the price list). For more information please see FarPoint Spread where you also can download a trial version of it. – It exist two types of controls that we can use. Those controls that requires Excel to be installed and controls without this requirement. – Among the two controls that require Excel to be installed the Office Frame Control is the best option. – Among the two other controls the FarPoint Spread is the best control. 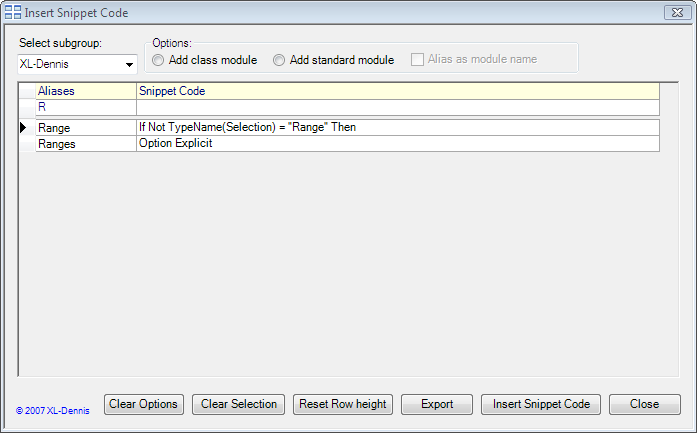 But since it’s a very expensive the Spreadsheet Component may therefore be more attractive (free). Finally, it’s the actual business needs that stipulate which control to use and not. One of the items on my To-do list is to learn more about RegExpression. Another item is Office Open XML (OOXML). Whenever I decide to teach me more about a specific topic I usually start to “google” to locate relevant online resources. If the subject is very interesting I also try to locate books on the subject as I still like to read printed books. The file format XML has been in focus for the last couple of years. The main reason is due to its platforms independence. Of course, whenever a “new kid is in town” it turns quickly to be a buzzword and XML is no exception. In order to understand and to work with Office Open XML it requires that we got the basic knowledge of XML. Open XML has been widely discussed for the last couple of months. Mainly because of MSFT’s intention to make it to an ISO standard file format. Except for that, it’s the XML file format to work with MS Office’s files (with and without MS Office suite) which also explain why it’s named as Office Open XML or for short OOXML. In the end of 2005 I read the book “Office 2003 XML” from O’Reilly which helped me to get a kick start with what Excel 2003 can do. Important to know is that it’s not the same file format which Excel 2007 use but Excel 2007 can read the older XML file format. Most Office users view the Office suite as tool set to get the work done. Since this is the primarily task with Office it’s difficult to disagree on that. But when discussing the OOXML file format we need to view Office as general-purpose interfaces to information. OOXML files can be created without Excel and other platforms like Visual Studio.NET, SQL Server, SharePoint Server et al as well as other non-MSFT platforms & tools can read and update OOXML files. In this context the real power of the OOXML file format is exposed and the OOXML files become more of ‘containers’ for information then just Excel’s files. Before moving on with the online resources I would like to highlight Stephane Rodriquez excellent work. He is ‘the man’ when it comes to Excel’s file formats and I’m very impressed by his strong commitment to the field. xlsgen – Home of Stephane’s commercial tool ‘xlsgen’ and it also contains all (?) 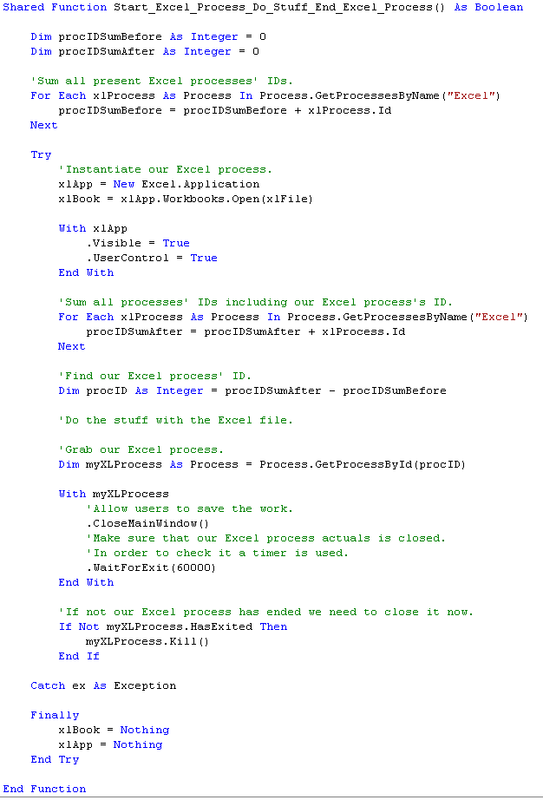 information about Excel’s object model COM interface. Wikipedia – A general good starting point and easy introduction. I will get back on the subject next year but right now I just want to learn more about it. Does anyone else have information about additional useful online resources and perhaps about other books about OOXML? Based on input from some testers I decided to implement a dedicated Windows form to only insert code into modules with. 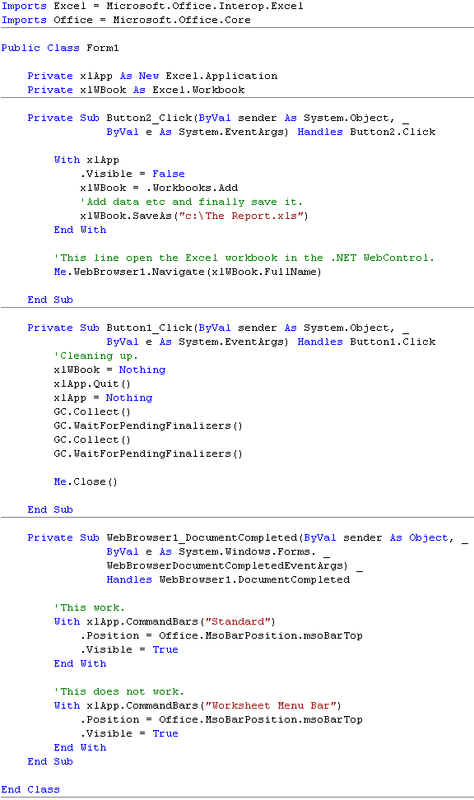 However, all other ideas and suggestions may only be considered to be implemented in future updates of .NET Co Library. In one of the previously blogpost (.NET Co Library – Part II) the main form for managing code (delete, update and insert code) was presented. 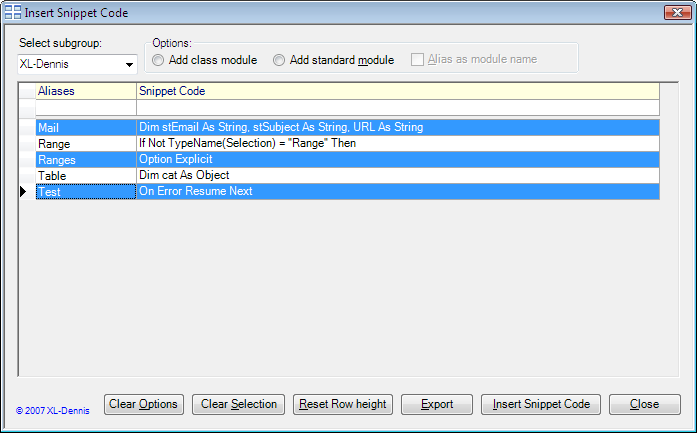 Now I have added a new option to insert code in present code modules and also to add code to new added code modules (class and general modules). 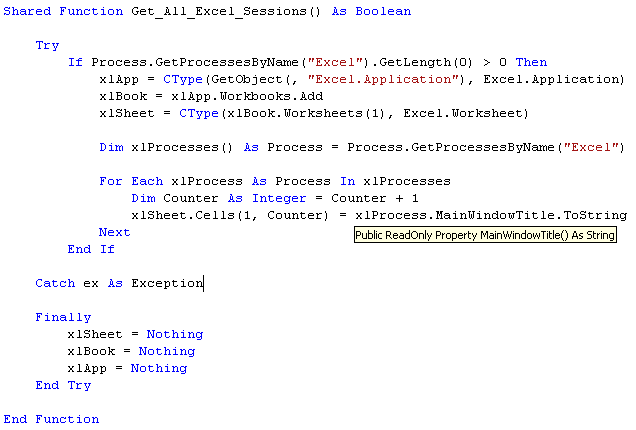 Since I have had (and still have) issues with making Windows forms modeless in the VB Editor I have solved it by setting its property TopMost to True (Actually, the problem is that Excel crash when closing it due to the modeless status). The drawback with this solution is that the Windows Forms always stay at the front even if Excel is not the active program. Finally, the Export button export all code to a RTF file. At present I’m pleased with it but I may in an upcoming update make it possible to export selected code to a RTF file. That’s it! I will now set focus to write the complete helpfile for this utility.